There is an increased awareness that business people do not live in their business bubble, just doing business, but are an important part of our society. We have to take a stand on pressing issues on our globe. That means getting involved in political and philosophical discussions. On privacy and personal data: what if there is a central storage place for all your personal data in the internet? Each company has to put their – no your – data into that storage, and you decide who can see what. And what you want to keep. A rather radical idea to reclaim the ownership of our data. Jeremy Rifkin gave an emotional speech that we only have a couple of generations to turn around the fate of our planet. According to him, the decrease in marginal cost in information exchange, transportation, and energy production is the source for living in a different way. The only question that remains: will it come fast enough? Oliver Samwer and Philipp Schindler said in two seperate sessions how Silicon Valley sets itself apart from Europe: the ecosystem and the entrepreneurial spirit, both attracting more talent and money. As in the other years, Scott Galloway talks about the Gang of Four: Apple, Amazon, Facebook, Google. Impressing performance you can watch here. I didn’t know that professors are so good at imitating Adele. Luciano Floridi talked about the four phases we have been going through as human beings. The common theme: we thought we were at the center and special, only to learn that this is not true. It started with Kopernikus who put the sun in the center. Then followed Darwin, putting us on equal level with other living beings. Freud took away our belief that we are rational and in full consciuos control of ourself. And now, we learn that the capacity of artificial intelligence will challenge our uniqueness of thinking. 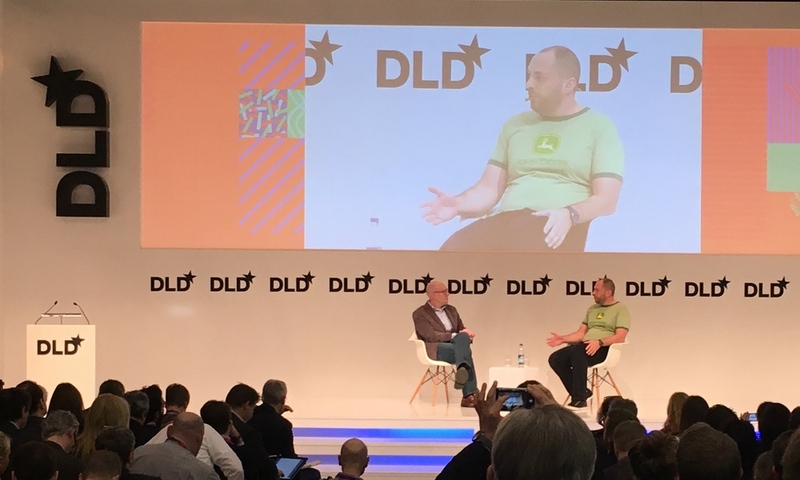 In general, maschine learning and artificial intelligence was a large theme at the DLD. One of the respective speakers, Prof. Dr. Jürgen Schmidhuber, also wrote a klartext at XING about the topic. Reed Hastings gave some insight about how he runs his company. He views himself and his leadership team as a group of people managing a portfolio of parallel bets. It is all about a system of people and gut. You need data for sure. Through data you are able to use your informed intuition for decision making. For Jan Koum from WhatsApp, the difference in all the messengers lies in the way they build the graph of their users, how people identify themselves: through mobile phone number vs email vs facebook accounts. This leads to different ways of using the messenger and interacting with others. John Hagel explained the power of stories and the overarching narrative they form. It is not enough for a company to tell people that they should watch and buy their products. Narratives focus on the larger horizon, emphasize opportunities, and discount risks. They build trust and loyalty. They create meaning. What is your personal narrative? Olaf Koch from the Metro Group explained that 50% of the variable compensation in his company is related to leadership behavior. Now that’s quite significant. Sleep enough! Arianna Huffington, Miriam Meckel, and Hans Ulrich Obrist discussed how important sleep is. Till Roenneberg, a professor from the LMU researching about sleep, shared a provoking comparison. When you put clothes in a washing machine and the program is supposed to run for 2 hours, you do not stop it before that time as you do not want wet and dirty clothes. So why is it that we use alarm clocks to disrupt a good night sleep before it is finished? Oliver Bäte, CEO of the Allianz, said digital is not about technology, but people. He wants to evolve his BtBtC business partially into a BtC business. Everybody’s business will blossom if it looks after the people. In the last talk, Niall Ferguson explained what history is all about. He claimed that history evolves around the three axis of nature, networks, and hierarchy. While we have less control about the nature, in human societies there is a constant interplay of networks and hierarchy. Networks bring innovation while hierarchy promises security and stability. On youtube, searching for DLD16, you can find the videos to many talks and panels.